When it comes to selling handmade online, It doesn’t matter which marketplace you sign up for, which platform you use to build your website or which social media site you post to, you cannot rely on traffic just rolling in. I really do wish it worked that way though, for your sake and mine. I help run one big website and it’s a constant cycle of of trying something new, marketing it, watching stats and tweaking. It takes a lot of work y’all. There isn’t an option that allows you to create, throw a quick pic up and fuhgeddaboutit. I just want to put this out there when it comes to running a handmade business in general. With a few exceptions, success does not happen overnight. There can be spurts of growth but for the most part, handmade businesses follow a gradual increase in traffic and sales over time. And that’s a good thing, you should feel good about that. There are so many “Income Report”, “How I made X amount this month” or “How I grew my subscribers to X in one week!” articles out there. Although they can hold valuable info, I think we’re all starting to feel a little inadequate because no one is sharing the crappy months or beginning stages when numbers aren’t so impressive. But every handmade business goes through them. Keep that in mind when you’re comparing yourself to others. This is your handmade business, your journey and your time. Compare your business to your business last month, not to someone else’s business that has a 5-year head start on yours. Now that I’ve gotten that out of the way, let’s take a look at how you can strategically and gradually get more people noticing your handmade listings, visiting your online shop and making a purchase. Before you start promoting the handmade products in your online shop, you should make sure all your ducks are in a row, which this article will help you do. There’s no point in hustlin’ on social media or at live events to drive people to an ineffective shop. Also, before we start, take a moment to think about why you head into a shop, online or off. What makes you spend a few seconds clicking/looking around vs. several minutes? How do you choose which items you click on/pick up, read the description/label or place in your shopping cart? And when do you know for sure; this item is for you and you’re ready to buy? Your shoppers probably notice, look around and buy for the same reasons. Let me help you think about that process and have a critical look at your online shop. Shopping in person is something we’ve all done, and imagining the way shoppers interact with a physical store may help you imagine the process of someone shopping for handmade online. Although they’re very different shopping experiences, the process and challenges are similar. Imagine a shop owner starting a small boutique on a busy street of their city. They’ve stocked the store with blankets plus a few other products and figure there’s tons of traffic around so they’ll have no problem getting people in their store. But the day finally comes to open those doors and no one is coming through. The few people that do come in just look around and leave without buying. Let’s take a look at the 3 areas the shop owner should assess and the 3 questions they should ask themselves. 1) HOW DO YOU GET PEOPLE “THROUGH THE DOOR”? The shop owner knows what they’re selling; blankets. But they don’t know who they’re selling those blankets to. They figure anyone could use one so why narrow it down? They place a new blanket in the window each week in hopes that it will catch someone’s eye. One week it’s a luxurious contemporary blanket, the next it’s a vintage quilt. The following week it’s a princess themed blanket and the week after that, a blanket fit for a man cave. The blanket alone hung in the window isn’t enough to catch the eyes of busy people walking by and the revolving theme creates confusion for those who pass the store each week. The window display isn’t speaking to anyone in particular so no one pays attention. If the shop owner was targeting a 25-year-old male bachelor on a budget, they may alter their signage and the picture they paint in their window. They might show the blanket on a black leather recliner chair with a sport-themed pillow and next to a side table holding a beer and remote. Their signage could state why it’s a good deal (e.g. they may have a buy one get one ½ off deal going on or the blanket may be stain resistant so beer and pizza spills come right out…no need to buy a new one; this blanket will last a lifetime). This would catch the attention of male shoppers and show value for those on a budget. If on the other hand, the shop owner was targeting 30 – 40 year old women who are married, have dual income and are phasing out their bachelor/bachelorette décor while working in more sophisticated pieces, they may create a picture of sophistication and luxury. They could paint the window walls a soft taupe color, add a taupe colored chair with a faux fur pillow and drape the cream blanket over the chair. They may also add a book and a coffee mug on a side table so the passerby imagines cuddling up with the warm blanket on a Sunday Morning. Their signage may explain the soft, sophisticated comfort they provide, while their display shows it. BUT CAN’T THEY JUST CREATE BOTH DISPLAYS AND ATTRACT BOTH SHOPPERS? If the shop owner tries to please both people by creating one display one week and a completely different one the next, they may attract a new type of customer but they’ll be missing out on building a loyal, solid customer base. I’ll explain why in the next sections but consider a new customer for a second. It typically takes several encounters before a shopper turns into a customer. If the bachelor walks past the window on his lunch break, it might take him seeing that window display 6 times before he decides to head in and check things out. By the time 6 encounters come around, the shop owner has switched up the window and is now marketing to the 30 – 40 year old woman. Had they switched up the window display but continued to target 25-year-old bachelors, they’d still capture that shopper and give him more reason to stop in. The bachelor may start to question the shop’s authenticity. They thought it was a hip boutique catering to a bachelor lifestyle. But when they see a My Little Pony blanket displayed, it completely throws off their perception. They no longer feel the store is a fit and may even feel a little duped. If that bachelor happens to head into the store on the first, second or third encounter, how are they going to feel once they look around and see there’s only one blanket for them? The rest are suited for babies, children or are more feminine styles. It may throw off the sale and make the bachelor think it’s not the right blanket after all. Or if he does buy, he likely won’t come back because he purchased the only item for him. He’d be more likely to tell friends about the store and stop in to see what’s new each week if it was more of a man cave and felt like a bachelor’s paradise. If you’re constantly posting new handmade products to your online shop to keep listings at the top of feeds, you may be rushing the posting process. Taking photos, writing descriptions and filling in details for each handmade product is a lot of work so it’s no wonder photos can get a little lackluster and titles a little plain (e.g. “Cream Blanket”). But the listing process is essential to getting people to click through to your online shop and buy one of your handmade products. When selling handmade online, you’ll attract more attention and clicks if you’re targeting your listings to someone specific. And if you’re consistent with the type of person you target, you’ll begin to build a loyal audience. Otherwise it’s creating the revolving window display situation. A shopper sees your handmade product on the first page one week. The next week they come back and you have a new listing up but the shopper doesn’t notice it because it no longer matches their taste. If each time they come back you strengthen their connection to your business by having another handmade item they love, they’ll be more likely to visit your online shop, buy and buy again in the future. When selling handmade online, specifically, who is your product for? Who do you see buying and wearing/using/displaying it? Are they male or female? How old are they? How much money might they have to spend on your type of product? Are they married and decorating their home for two people or single and buying based on their tastes? Once you define who you want to attract online, you can think about how your product’s photo, title and price appeal to them. The image you choose as the main photo for the listing should attract the customer you picture buying. Choose one type of customer to target for the listing. Just as you can’t place one blanket in the window and have it scream “bachelor pad” and “sophisticated, feminine home”, you can’t use a photo or title that attracts opposite types of customers or speaks to a wide variety of tastes. Often times, we start making handmade products for ourselves, and therefore, we are our ideal customer. What would catch your eye as you’re scrolling through photos online? If you aren’t your ideal customer, you should get a specific idea of who your customer is so you can define the look they’ll be attracted to. Should your photos be light, bright, airy and feminine or dark, moody and masculine? Maybe they should be colorful and playful or muted, rustic and charming. You can play around with backdrops, props, lighting, editing, etc. to create the look and vibe your ideal customer will be attracted to. Which keywords would you enter into the search bar when shopping for your handmade product online? (think like a customer not a creator or business owner) You want your product titles to be specific and use keywords people might enter (e.g. chunky knit cream throw blanket) but not so specific that no one would ever search them (e.g. handmade chunky double back cross stitch dove’s wing white…that’s a little out there but you get the idea;). Keep your customer in mind and think about the keywords they might use. While a 30-year-old female who’s moved into her dream home and is looking to add more high-end items might search for a “Chunky Knit Cream Merino Wool Throw”, a 25-year-old bachelor likely would never type those words into a search bar. Price point is the other piece of information that shoppers see before clicking through to an online product listing page. This is not to say you should alter your prices to fit your customers’ budget. Nuh-uh! Set your prices based your costs and profit. But, you do want to think about whether your prices match the customer you’re wanting to target. For example, let’s say that cream, wool throw costs the handmade vendor around $20 in material and time to make, so they charge around $80 for it. If they’ve decided to target a 25-year-old bachelor, that may be more than he’s able to spend on a blanket. He may be furnishing his first home or living with roommates who aren’t exactly the tidiest. He likely isn’t ready to spend $80 on a handmade blanket during this period of his life. If you realize the price point may be a bit high for the customer you’re targeting, consider aiming for a new customer. Or you could take a look at your costs to see if you can either find your materials for a cheaper price or reduce the time it takes you to make each item. For example, let’s say the vendor is making Mermaid Blankets and targeting moms (since they’re the ones doing the buying). They could either aim to target moms who have a higher budget by improving their photography and painting a more sophisticated picture (e.g. instead of placing the blanket on the ground and snapping a pic with their phone, they hire a professional photographer to photograph it collections and take a variety of lifestyle and product shots.) Or they may reduce their costs by using an acrylic yarn instead of merino wool and knitting the blanket in one color instead of creating a multi-colored striped version that takes more time. Consider if your prices may be too low for your ideal customer too. If you’re targeting a sophisticated customer who wants to buy “luxury”, a low price point will throw them off. If you were to go shopping for a luxury car and expected to pay around $60,000 but come across one that claims it’s high-end but is half the price, you’d question the car. You wouldn’t think: what a great deal, you’d wonder: what’s wrong with it? Take a look at your photos, listing titles and prices to be sure they’re all speaking to the same type of customer. 2) WHAT MAKES SHOPPERS PUT HANDMADE ITEMS IN THEIR ONLINE CART? The shop owner has now completed #1 and determined they want to attract 30 – 40 year old females who are married and looking for higher-end pieces to fit their budget. They’ve updated their window and tailored it to women but kept it somewhat neutral and not too feminine to help shoppers imagine the blanket in a family home. They’ve got more shoppers coming through their doors but they’re still not seeing a spike in sales. Although the exact customer they wanted to attract is coming in and checking out their front display featuring the blanket, they’re not staying long and are leaving without buying. Why is that? Well…..the shop owner doesn’t have any signage for the in-store feature display to communicate the different benefits and uses of the product and their sales team isn’t sharing them when talking to shoppers. The feature display is also a little lackluster. It should be elevating the excitement for that blanket after it’s seen in the window but instead it falls flat. The shop owner kept their ideal customer in mind when creating the window display but forgot about her when merchandising the product in-store. It’s thrown on a table with extra stock placed in plastic bins beneath. “Sophistication” and “luxury” have gone out the window. The shopper also can’t find additional information that answers her questions or concerns about the blanket. They’re all folded in plastic packages so they can’t see the size or feel the softness. They don’t know whether it’s machine washable, if it will hold its shape and wear well or how it might look when it’s not draped over the back of a chair. The next page shoppers usually land on if they like your first impression is the product listing page. This is essentially your sales page; where you sell the shopper on why your product is right for them and help them imagine it in their lives. They know what you sell but do they know why you sell it? Why is your handmade product better than the 100’s of others that came up in their search? Consider your ideal customer when selling handmade online and get into their psychographics…which is a big word for the reasons why they buy. What are the thoughts, beliefs, worries, etc. behind their purchase? Which wants and needs is your product going to fulfill for them? How can you communicate that through your description and additional product photos? Try not to rush through this part of the listing process. Each shopper is different and some people love to read through a lengthy description and understand every little detail about the handmade product they’re thinking of buying. I definitely do this when it’s an item that’s a little more expensive and I want to be sure it’s the right fit for me. If I see a description that’s bare bones and only points out the obvious; cream blanket, chunky knit, handmade. I sort of wonder how much care the vendor puts into details. What do the finishing touches look like? How will my package arrive? Are they going to feel annoyed if I send questions asking the exact dimensions or how to wash the item? But if I read a description that is full of personality and describes my exact situation of wanting a beautiful blanket for my living room that’s oversized and will cover beyond my toes, won’t get snagged by my cat and can be washed at home, I build a connection with a vendor and become a little more committed to purchasing. I feel as though they’re going to be a friendly person to deal with and I trust what they’re saying is true. They obviously get what it’s like to have a cat snag your beautiful new knitted blanket and the annoyance of having a blanket that looks great but doesn’t cover your whole body. Think about any questions customers have asked before purchasing. They may come through comments on a social media posts, messages from your website or in-person at a craft show. These will be good points to include in your online description. I would say in almost all cases, upload more than one photo of your handmade product online. People want to see it from different angles, get a different perspective and imagine how it will look (either in their home, when they’re wearing it or see the results they’ll get from using your product). Carry the look of your main photo throughout your additional photos. You don’t want a beautiful photo shown in the main feed and when they click through to the listing they find dark, blurry, unprofessional photos. That will throw off the hard work you put in to get them “through the door”online. Use your photos as your description as well. Some shoppers don’t like to read lengthy descriptions and would rather click through images. Communicate important details through visuals and try to evoke the emotions you want your customer to feel. For example, the blanket might be shown neatly folded with other color options as well as unfolded and covering an adult to help the shopper get an idea of size, colors and thickness. There could be detail photos of the knit and care label. The picture of it in use could help evoke the feeling of being cozy; with a steaming cup of tea on the coffee table and the sun streaming through a nearby window. Think about when you’re shopping for an item like yours online and the different angles, details, settings, etc. you might like to see to get a better idea for the product and imagine how it will look in your home (or when you’re wearing it or the results you might get). If you sell at craft shows, watch how people take your handmade product in. Do they look at the bottom, look inside, check how the clasp works, etc.? Those will be good indications of which pictures you may want to include online. *Side note: if you do sell at craft shows check out this FREE 5 DAY CHALLENGE to help you create a standout display that converts shoppers into customers. Take a look at your policies and shipping as well. Do they encourage a sale? You need to set rules based on what’s best for your handmade business but there’s always a way to deliver not so positive news in a positive manner. For example, if you don’t except returns, instead of writing NO RETURNS, you may write: Due to the nature of this handmade product, I am unable to accept returns. However, I do take great care when creating each piece and inspect all items before they are shipped to ensure quality. Shipping prices can throw a sale off as well. I know shipping fees are out of your control but consider if you can work part of them into your prices. “Free shipping” is never actually “free”, you’re paying for it somewhere; it’s usually just hidden in the cost of the product. I’ve personally been thrown off when I get to the checkout and shipping is almost half the price of the product. If a product is $20 and costs $10 to ship, I may abandon my purchase. But, if instead, the product is $25 and the shipping costs $5, it seems more reasonable to me. It’s the same total, but if you research “Pricing Psychology” you’ll find studies that show minor changes can have an impact on sales (e.g. $9.99 will encourage more sales than $10). Take a look at your description, additional photos, store policies and shipping options to be sure they answer all questions the shopper might have and make them feel comfortable enough to buy. 3) WHAT SEALS THE DEAL? The shop owner has fixed up their front window display and the featured product display inside the store. Customers are now coming in, spending a few minutes looking through the feature blanket display, putting one in their shopping cart and browsing through the rest of the store. But now the owner is finding a bunch of abandoned shopping carts around the store. They have product in them but the shoppers decided not to buy. Now what’s going on? My guess is: the shoppers got thrown off and spooked. The rest of the store is a little “blah” and doesn’t match their window or feature display. There also aren’t any indications the business is legit and the store will still be around tomorrow. No signage, no logo, no permanent fixtures, etc. The sales associates don’t know much about the company and can’t answer questions around how long it’s been in business or who the owner is. The sophisticated vibe they get at the beginning of their shopping experience is tarnished as they walk around and see lower quality blankets mixed in with higher priced ones, kid’s themed blankets and some odd products that just don’t look like they should be in the store at all. Some displays look high-end with beautiful props and fixtures while others look like they’re out of a discount store. They can’t find anything else to put in their cart and are starting to question the authenticity of the store and the product. The lack of branding and consistency has shoppers worrying that the quality of the blanket might not fit the price and if there’s a problem with it once they get it home, the store might close their doors before they can head back. They really like the item but decide to think about it before buying. They leave the store and forget about it shortly after. There was nothing memorable about their experience to create a reminder or to encourage them to come back. Online shoppers may get a little thrown off if they head to a store and see an empty bio, an off-brand logo or handmade products that don’t fit the vibe they got from the product they just put in their cart. If you’re only able to make one product really well, consider only offering one product in your online store and variations of it. There’s absolutely nothing wrong with that. If you’re so busy making new handmade products to list that you don’t have time to give each product the same attention to detail or your branding has to take a backseat, your sales may suffer because of it. Your brand should be carried into every part of your handmade business; from the way you write your description and photograph your products to the name of your online shop, logo and bio. If you want to attract 30 – 40 year old females with a healthy disposable income and a sophisticated style, your business name, logo, tagline, bio and images should all speak to that customer. Think of the feeling or vibe you want your brand to have (e.g. sophisticated, fun, playful, modern, etc.) 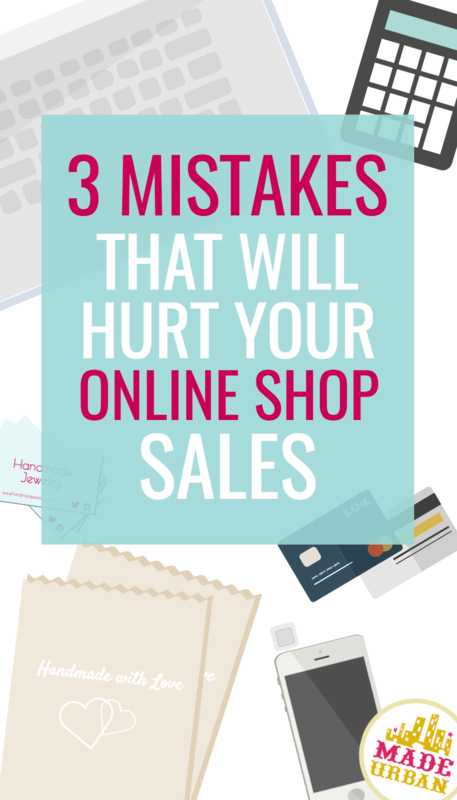 and consider whether that comes across in every element of your online shop. An empty or outdated bio may make the online shopper wonder how often you tend to your shop or how much attention you pay to the details. Have a look at your logo and any additional business photos you upload to your online shop and be objective. Does your logo speak to the person you want to attract? Does it communicate, through visuals, how you would describe your brand? Each handmade product listed in your online shop should work with your brand and create a theme. Your photos should look like they’re coming out of the same catalogue and all have a similar aesthetic. Although you’re selling to a wide variety of people, one type of customer should be kept in mind for each product you make, photograph and post. There should be aspects of that customer that almost always stay the same (e.g. all your customers are female and sophisticated), while others may vary (e.g. some may be married while others are single). You’ll get a few people who fall outside your guidelines but the majority should fit within. Where the traits vary is where you can create variation. This ensures you target a niche market but still offer selection. For example, all blankets in a store might be targeted to females with a sophisticated sense of style. But some may have more of a neutral style that appeals to both a man and woman so it fits in a shared home. Others may have a very feminine style for a female who lives alone and is decorating to her taste. “Females” and “sophisticated” are the constants of each product. Adding in a crocheted Minions blanket doesn’t appeal to the same customer or fit the brand. This is not a rule, you have to do what’s best for your business, but my guideline is to try to stick to one category all your products fall under (e.g. Art, Accessories, Bags, Bath & Body, Children, Home, Jewelry, etc.) and maximum 5 subcategories/types of products you offer (e.g. blankets, pillows, rugs, etc.) When you’re starting a handmade business, sticking to one category and just a few types of products under it will allow you to find your niche, build a brand and perfect your craft. If doll clothes and leg warmers are thrown into the online shop with the blankets (category: Home), it now adds the categories, Children and Accessories into the mix. It gets a little harder to perfect blankets, doll clothes and leg warmers and keep them all on-brand. Focusing on just blankets leaves time to brand and market the business and there are still ways to add variation. Blankets: throws, baby blankets, mermaid blanket, etc. Pillows: throw cushions, foot cushions, knot pillows, etc. Rugs: round rug, rectangular rug, square rug, etc. 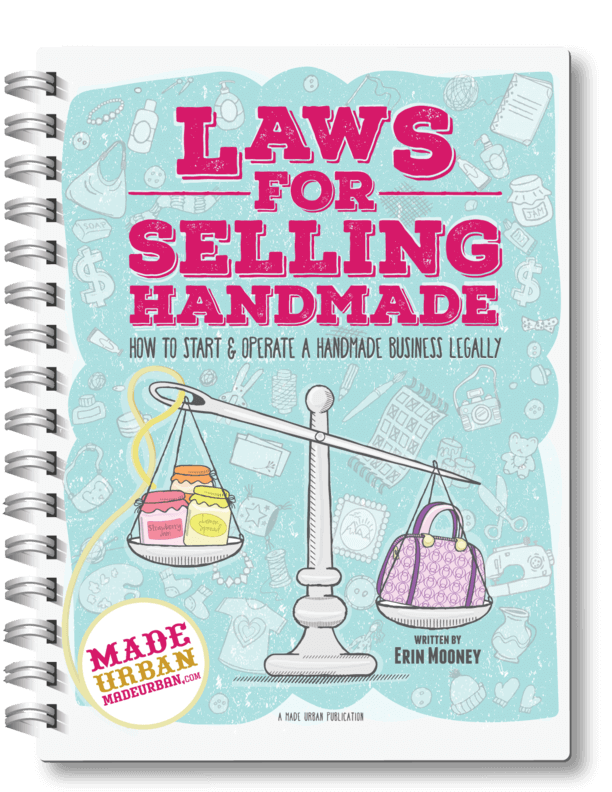 As your handmade business grows and you start to create systems to help it run smoothly, you can expand your product offering to more categories, more types of products and more variation. But in the beginning, you’ll likely want to build a name for your business and do one thing (or a few things but not many things) and do it well. Keep an eye on any comments or reviews as well. Do your best to follow up with each online shopper to ensure they’re happy with their purchase and ask if there’s anything you can help them with. Following up makes each customer feel cared for. If they are unhappy, you find out before they write a negative review and have the chance to correct the situation. You can’t control what people write about your handmade business but you can do your best to give them a great experience. Answer messages in a timely manner, complete orders when promised, keep customers in the loop, let them know when their package has been shipped and carry your branding and amazing customer service throughout the entire experience. Take a look at your branding, product offering, categories you sell under and the customer experience you provide when selling handmade online. Be sure they’re all speaking to your ideal customer and nothing is throwing them off. 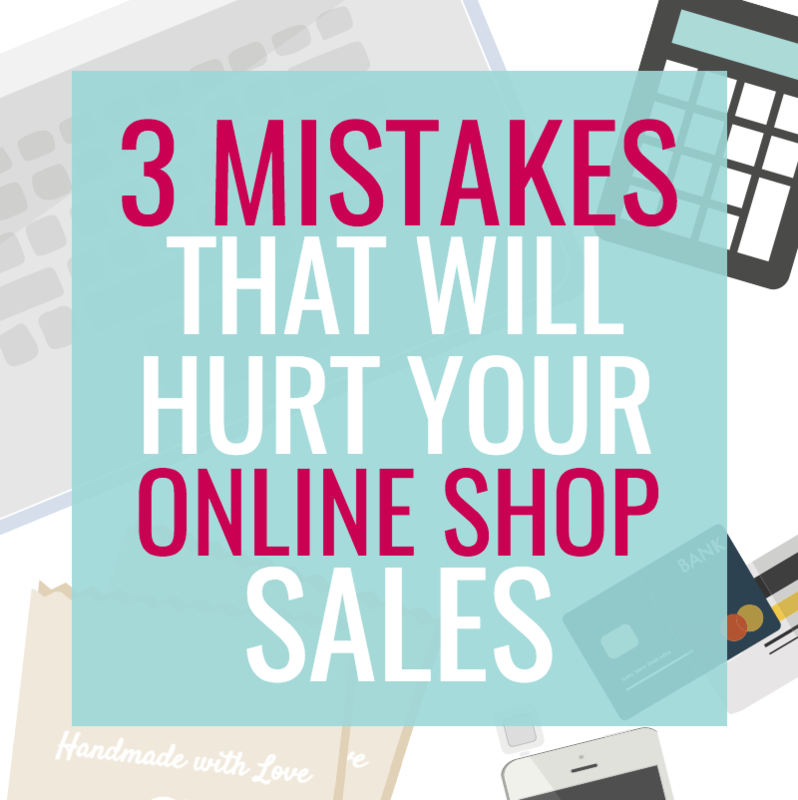 I hope these 3 questions have helped you with your online shop! Remember; make small changes and don’t look for big results. Growth happens slowly over time and running a business takes constant attention, adjustments and work. came across your blog via PInterest (and will repin) and am blown away by the smart advice and the very obvious care that goes into the posts. Thank you so much. Thanks so much Magdalena! I’m so happy to hear you’ve found the information helpful and are enjoying my blog 🙂 That’s amazing to hear about your display too! Thank you for taking the time to comment and for reading. Wishing you lots of success! I have pinned this. Written so enthusiastically. Made me want to read not glance at not skip around but read and keep absorb and act on. Thank you very much. I have subscribed and am taking the challenge.